The Tata Tigor JTP is a sportier a more powerful version of the regular Tigor, we first saw the car early this year, at the Auto Expo 2018, alongside the Tiago JTP. 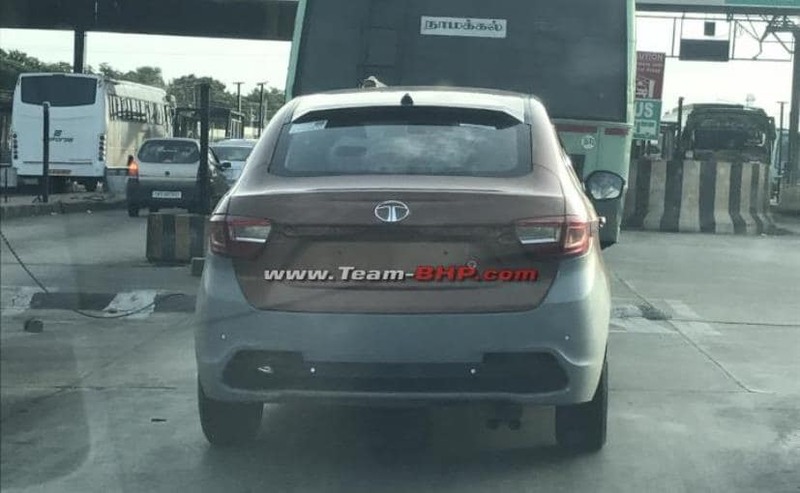 Yet another test mule of the upcoming Tata Tigor JTP edition has been spotted testing in India. The car was spotted somewhere on the outskirts of the Coimbatore, where it is currently under development as a collaborative project between Tata Motors and Jayam Automotive. Essentially a sportier a more powerful version of the regular Tigor, we first saw the car early this year, at the Auto Expo 2018, alongside the Tiago JTP. While the carmaker hasn't mentioned a timeline for the launch of the car, these frequent sightings of the prototype of the Tigor JTP indicate the car might be launched by the end of this year or early 2019. Here we only get to see the rear section of the car, revealing the new dual port exhaust system, and an updated rear bumper. However, based on some previously seen spy images, we know that the Tigor JTP will retain the basic design and styling cues of the regular Tigor. Having said that, it will come with a bunch of cosmetic updates like a hood vent, new black front grille and smoked headlamps, new alloy wheels and more. The concept car we saw at the Auto Expo also featured JTP logo on the front grille, and we hope to see similar branding on the production version as well. As mentioned above, the Tigor JTP gets a more powerful 1.2-litre turbocharged three-cylinder petrol engine, borrowed from the Tata Nexon. The engine is tuned to offer 108 bhp and develop a peak torque of 150 Nm of peak torque, a significant bump over the current output. The motor comes paired to a 5-speed manual gearbox, which Tata says gets optimised gear ratios. Mechanical upgrades will include a revised suspension setup with lower springs and a lower ground clearance too.